Wardrobes are rare in India, as they tend to fold their clothes rather than hang them, so grab one of ours while you can. 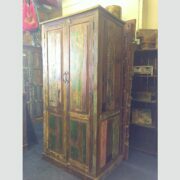 Some people choose to get a nice cupboard instead: they don’t have the hanging rail, but can still be used to store your clothes. 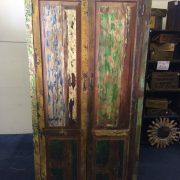 Choose from a variety of styles as available including hand painted, old, vintage, industrial, reclaimed, sheesham… All of our Indian furniture is handmade and is available to buy online or instore.